Eventually, PCBWay has launched the wildly-anticipated function---Get gerber file parameters automatic. Please click here to check it on Quick-turn order page. Are you annoyed or troublesome with filling in the board size, hole and track/spacing before uploading your Gerber files? Do you want to submit the file at first and get the parameters automatically? Now, PCBWay offers all PCBWayers a ‘Gospel’ – DFM beta! We take our customers feedback on board and with five-month engineering, the new and more convenient tool finally has been open to the public for free! If you want quick-turn PCBs, just go to this page. But if your designs are complicated and need advanced PCBs, Standard page is suitable for you. Let's see how different the two pages are. 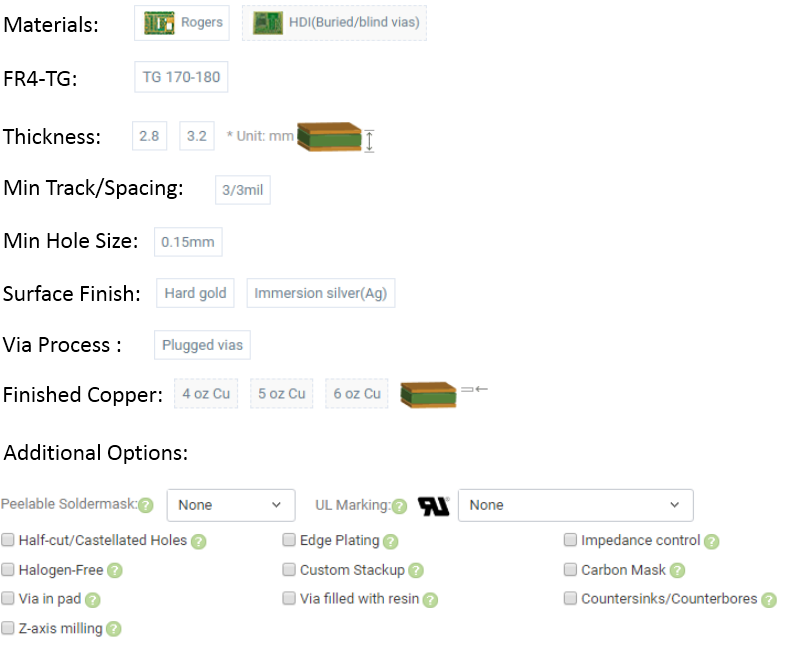 As you may know, PCBWayers usually use this page to get the quote. HOWEVER, we also add more fresh choices for your particular designs. Then, What are they? seeing the below table. Wow, is that clear? Trust you know well about which way you prefer. So we have to remain the standard one for those whose Gerber files are complex that require more demanding features. This page applies to most of PCBWayers who would like to get quick-turn PCBs. The PCB manufacturing time is shorter than advanced PCB. The Get gerber file parameters automatic tool is able to automatically set the board size, hole, track/spacing. only accept.rar or .zip & Maximum 20M. As expected such, It saves your time and there is no nuisance of filling in fussy data anymore. Get gerber file parameters automatic tool gets your uploading process and quoting faster. The most conspicuous feature of the advanced tool is convenient and time-saving. You don't have to stare at the table and put the parameters manually one by one. Currently, the tool is a baby in the cradle. PCBWay team will breed it and make it stronger. It will be upgrated and be a mature version in the near future. Finally, thanks all staff who have made the contribution that took PCBWay teams' painstaking care and efforts. We always embrace our customers' suggestions and take into consideration. May you enjoy the new tool and hope everything goes well for all of you.